With a Yoga, Dance and Qigong background, Brenda creates unique Vinyasas that you will never see anywhere else. 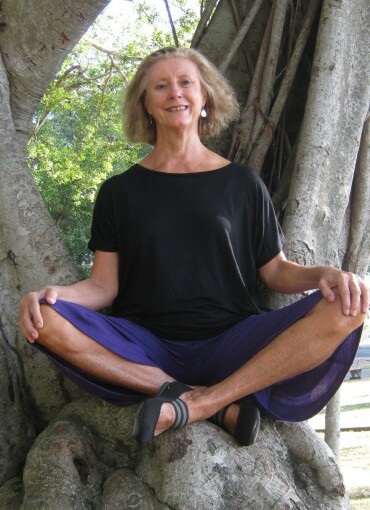 Brenda Lyons (M.A., RYT-500) has been practicing yoga since she was 14 years old, and took her first Vinyasa Yoga Teacher Training with the White Lotus Foundation in Santa Barbara, California. Brenda has also studied with master teachers Shiva Rea, Erich Schiffman, Baron Baptiste, and Angela Farmer, and has earned additional certifications in teaching Yoga for Stress Relief, Restorative Yoga, Creative Yoga for Kids, Kripalu Yoga in the Schools for Teens, Yoga for Cancer, Yoga for Seniors and Partner Yoga. Brenda was introduced to Tai Chi and Qigong 28 years ago when she moved to Taipei, Taiwan. Since then, she has studied with Qigong masters in Malaysia, the USA, and most recently in Mainland China. Prior to moving to Panama, she offered Qigong classes to the expatriate population in Shanghai and taught at the Omega Institute for Holistic Studies in New York. She has also taught Tai Chi and Qigong in Malaysia, Ethiopia, Aruba and Venezuela. Brenda is also a teacher of Mindfulness, having trained in the U.S. based Mindfulness in Education program, the UK Mindfulness in the Schools Dot B program, the Mindfulness Without Borders program, and the Google Mindfulness Signature Training program. Most recently, she has been leading Introduction to Mindfulness, Mindful Eating, and Mindful Use of Technology Workshops, as well as 8-week Mindfulness for Teachers sessions in Asia and Central America. Brenda has also published articles internationally in the areas of health and well-being. Her aim in all of her teachings is to inspire and empower people through the mind, movement and breath to tap into the healing energy within all of us for improved mental and physical health. Brenda will be completing her 1000-hour Yoga Therapy Professional Certification at the Kripalu Integrative Yoga Therapy program in the U.S. in March 2019 and is available for private Yoga Therapy sessions.